How Zenair 701 & Savannah aircraft fly better with VGs than with Slats!!! It was way back in 1990, at the Sun’nFun fly-in at Lakeland, Florida that I first heard about the possibility of flying a Zenair CH701 without the leading edge slats. I was very interested in the CH701, so was hanging around the Zenair display, and there met a couple of CH701 fliers from Colombia. (Usual reaction at this point is that, “... it must have been for the drug trade…”, but that’s nonsense – this was the days of 532’s and early 582’s, and the drug syndicates didn’t need to fly over the jungle in two-stroke ultralights, they had the best of Bell helicopters!) The real reason there were so many CH701’s flying there, is that Columbian men are real macho and always ready for adventure, and a local manufacturer was building them ready to fly, so this aircraft suited them very well! Anyhow, these fellas told me that they had removed their slats and their aircraft flew better! This was a real surprise, since those leading edge slats are one of the main distinguishing features of the Zenair CH701! They spoke a bit of English, and I spoke a bit of Spanish, so I questioned them over and over again just to be sure, and they assured me that it flew faster without slats, and landing speed was only a little higher. Ever since that encounter I’ve been telling the story to Zenair CH701 and Storch fliers, suggesting that they might try flying without their slats, but no one would, so it had to wait until I had a similar aircraft myself to give it a go. Now I’ve thoroughly tested it out on my Savannah (a brother of the CH701), and the results are astounding! I’ll never put the slats back on. Two Zenair CH701 fliers at our airfield have also removed the slats from their CH701s, and the results are equally impressive. So we now have a surplus of used slats hung up in our hangars……. 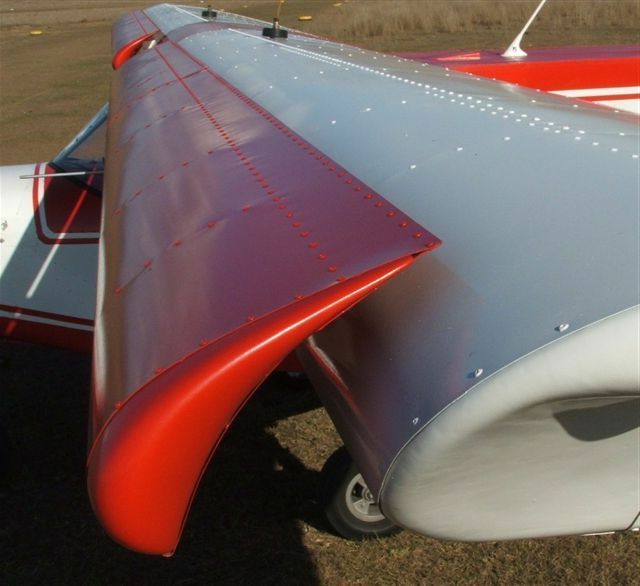 Much cleaner - an excellent STOL wing! The vast reduction in drag allows all these aircraft to fly considerably faster for the same power, climb better, glide better, and with the benefit of Vortex Generators, lift-off and touch-down just as short as with slats, but with more control. Top speed has gone from 94 kts to 103 kts! = + 9 kts. Fuel burn @ 75 kts has gone from 17 L/hr to 13 L/hr. = 23.5% less! Best climb rate @ 55 kts is 140 fpm higher. Best glide @ 40-45 kts is 100 fpm better. With slats – no real stall, just a stable high-descent mush @ less than 30 kts. Without slats, no VGs* – a distinct stall and roll to the left @ 34 kts. Without slats and with VGs – no stall, just a stable mush @ less than 30 kts. *VGs = Vortex Generators, more about them elsewhere. L/hr x 0.26 = US Gal/hr. Kts x 1.15 = mph. Note that the best rate of climb is 140 fpm better without slats. Below 40 kts the rates are very much the same, so angle of climb is unchanged. This testing was done in a ‘Savannah’ aircraft, a kitplane from I.C.P. in Italy . It’s a copy of the MXP 740, designed by Max Tedesco. It has the same wing profile as a CH701 but a longer, and a different tail section. Powered by a 100hp 912ULS, 4-blade Brolga prop pitched for climb (16° blocks), carrying pilot (73kg) and 30 litres fuel. All tests were done in as similar conditions as possible. It only takes minutes to remove the slats, so comparison tests with and without were conducted within one hour of each other, at the same altitude, in calm conditions, at first light before any thermal activity. Climb and descent figures were timed with a stopwatch between 2000 and 3000 ft QNH. Stalls and straight and level trials were conducted at 2000 ft QNH. The with/without tests were done three times to re-confirm the figures. The ASI was compared with the GPS by flying a 4-way course and averaging the legs, and found to be 1 kt low at 70 and 80, 1 kt high at 40 and 50, and spot on at 60; these corrections have been worked into the results. Indicated airspeeds at 30 kts and less are truly only ‘indicated’ – inherent limitations in the ASI and the pitot at these low speeds won’t necessarily give a true airspeed, but is still adequate for ‘before and after’ comparison purposes. But what about the C of G ? There was no change at all in the trim setting required for the same cruise speed, with or without the slats. Which just confirms aerodynamic theory that the slats aren’t providing any lift at cruise angles of attack – they just allow the wing to operate at an angle of attack above the normal stalling angle of about 16°. The large reduction in fuel consumption was the biggest surprise – 23 %! This was measured accurately and consistently on two long flights (50 hrs each) to Cape York and to Tasmania, from near Brisbane, Queensland (that’s equivalent to flying from Seattle to Anchorage, then Seattle to El Paso). On the trip to Cape York with slats on I used 17 litres/hr. ; on the trip to Tasmania without slats I used only 13 litres/hr, averaging 75 kts both trips. On both trips I was flying in convoy with another Savannah with slats. He used 16 litres/hr both trips which provides a good reference. The reason I used one litre/hr more on the Cape York trip, when we both had slats, is that I run a 4-blade prop pitched for climb, while he has a 3-blade prop pitched for cruise. I used the same 4-blade prop on both trips, and saved 4 litres/hr by leaving the slats behind – a total fuel saving for the trip of $250! I could probably get even better fuel economy with a 3-blade, but I just love the tremendous take-off ‘grunt’ of this 4-blade Brolga! The reason I got this Savannah aircraft was for it’s STOL performance, and I certainly wasn’t disappointed – it was always good. I was expecting to lose a little bit of that STOL performance after removing the slats, so it was a really pleasant surprise to find that, with the addition of the VGs, it has actually improved!!! The VGs serve pretty much the same purpose as the slats, but do it better, with less down-side. The Zenair CH701 owners have found the same improvements. I can now haul it off the ground sooner, with better control, and accelerate quicker in ground effect, and then climb away faster. With slats, when I hauled it back it would jump off just as short, but then wallow along, hanging on the prop, slowly accelerating behind the drag curve caused by that enormous slot exposed at that high angle of attack. Now it just jumps up and ‘flies’ away! And the climb rate is much improved. Slow, power-off landings are much easier and safer without the slats. With the slats on, as the angle of attack increased, the drag increased exponentially, so that the speed slowed very quickly and the aircraft would drop suddenly and heavily. Lots of 701's have been bent just this way! Without the drag from the slats, my aircraft now floats on much more gradually and gently, even if flaring a bit too high - it's very forgiving! Another advantage I didn’t expect is that the flaps are now much more effective. These flaperons provide lots of lift with little drag – the descent rate only goes up 50 fpm from no flap to full flap @ 40 kts. This makes landings at full flap easy and controllable at about 25 kts touch-down speed. With the slats on, power-off landings at full flap were risky because the drag built up so quickly at low speed that, if you’re not right close to the ground when it happens, you come down with impact…. Now it just settles on gently. And this makes sense by aerodynamic theory, in that the slats only do their stuff at a high angle of attack, while the flaps dramatically reduce the angle of attack – so they’re contradicting each other….. To get any real benefit from the slats I had to ‘hang’ on the prop, at a very high angle of attack, and control the descent rate by power, ‘dragging’ the aircraft in – I don’t like that approach at all; I prefer to ‘fly’ the aircraft in at idle power. And this Savannah with VGs instead of leading edge slats does ‘fly’ remarkably well now – I just love it!!! It now out-performs any Zenair 701 or Savannah with slats, both for STOL Ops and cruise. p.s. – Now you’d have to wonder why the manufacturers didn’t discover this long ago, eh??? Once again it may be the Colombians who provide the answer. They said that they were told, "......Shh, don't tell anyone, it’s the slats that sell these aircraft……". Well, I’m sure glad they told me about it, and now that I’ve tried it, I’ll tell everyone else so we can all benefit! At NatFly 2006, I displayed my Savannah with VGs instead of slats, and with a copy of this story taped to the side of the aircraft. The interest at NatFly was enthusiastic, because of course Aussie fliers are quick to pick up on useful ideas that are proven to work. All over the country now Zenair 701 and Savannah owners are shedding their slats and going to VGs. The visiting engineer from the Savannah manufacturing company in Italy looked at all my test data and then bought their first set of VGs from me! Now we learn that, after seeing my display at NatFly, and doing their own testing, the Savannah factory has brought out a new model, the 'Savannah VG', with a new leading edge and vortex generators instead of leading edge slats. So they’re still open to new ideas and quick on the uptake, and now they’re producing an even better aircraft! Those of us with original Savannahs who have just removed our slats and added VGs to the original wing are getting very much the same performance figures as published for the company’s new leading edge with VGs. So I’m eagerly awaiting the new Savannah ‘VG’ model, so I can do some comparison testing against mine with just the original wing with VGs instead of slats. The first of the new models are due out here in August, and a friend nearby will probably be the first to finish building one. He’s a good STOL flier so we should be able to do some really interesting comparisons. I reckon they’re going to be very much the same……. The Savannah manufacturing company is offering an upgrade kit, with a replacement leading edge and VGs. I sure wouldn’t be ordering that upgrade kit for $1000 until I see some really noticeable improvement in performance. To take the wings off, drill out all those important rivets in the spar (and end up with oblong and oversize holes), and then fight get that new skin (with an even sharper radius) installed so that the holes line up again, then paint it all again, I’d have to be sure there was a really significant gain to be had…… There’s certainly nothing at all wrong with my wing as it is – I just love it! Best to wait and see I reckon – we’ll probably know well before Christmas and will publish the results in this website. You can hedge your bets by leaving the slat brackets on the wing, but follow-up testing has now confirmed that the residual brackets do effect the airflow, and make the stall characteristics less than they can be. It's not really bad, still better than most other aircraft, but not as predictable and progressive as it is with the brackets off. I’m often asked just how to cut those brackets off with least hassles. I used one of those very thin cut-off discs in a small angle grinder. Just hold it at a 45º angle and carefully cut a groove on each side as close in as possible. Don’t try to cut right through – once there is a suitable groove on each side, you can flex the bracket a couple of times and break it off. Then just grind out any portions that sit proud of the wing. There are five rivets alongside the bracket which look really crude once the slat is off. I drilled them out and put countersunk rivets instead. I used polyester autobody filler to heal the scar, but epoxy filler would probably be better. I have a fetish for STOL Ops, and this Savannah with VGs is just ideal. It’s performing STOL so well now that I just can’t help showing off all the time, even on long runways! 240hours in the first year, and it’s all been a blast! For NatFly I had imported some VGs from the USA, and they sold to Zenair 701, Savannah, Bingo, Lightwing, Skyfox and Jabiru owners. Since then I’ve been doing lots more testing and comparison, and have come up with the new design of Stolspeed VGs that are described elsewhere in this website. Fair skies and tail winds.